The little white and blue porcelain teapot, just three inches high, was cracked, chipped, the handle had broken off and been glued back together in several places and it was missing its lid. Still, one man’s trash is another’s treasure, and one man (who has chosen to remain anonymous) thought there was something unusual about it. He figured what the hell, and submitted an online bid of £15 for it at a 2016 auction in Lincolnshire, England, making him 20 dollars poorer and one somewhat busted old teapot richer. The buyer consigned it to auctioneers Woolley & Wallis in Salisbury and their experts began to research in the hope of identifying the cracked, lidless teapot. They discovered that it is one of only seven known extant pieces of porcelain produced by John Bartlam of Cain Hoy, South Carolina, in the late 1760s. All six of the other Bartlam porcelains were also found and sold in England. They are believed to be part of a complete set that was sent to England for promotional purposes shortly after its manufacture. The teapot is Chinoiserie, employing Chinese motifs like two men in a sampan, cranes standing beneath trees, the Man on the Bridge pattern, and islands with pagodas. The two cranes vignette proved key to the identification. They are Sandhill Cranes, native not to China but to South Carolina, and they stand alongside Salbas Palmetto trees, not the traditional pine trees of Chinese design. The Salbas Palmetto is the state tree of South Carolina. It seems that the printmaker was inspired by a Chinese design but then replaced the far eastern species with native flora and fauna. John Bartlam, who was born in England and trained as a potter in Staffordshire, moved to South Carolina in the 1760s to set up shop taking advantage of its plentiful supply of kaolin clay and its wealthy, fashionable clientele willing to spend big money on porcelain, at this point all of it imported. In the past 10 years or so, following archaeological excavations at the site of his factory, scholars have recognized that Bartlam’s porcelain was the first to be produced in America, predating the better-known Bonnin and Morris wares made in Philadelphia from 1770 to 1772. 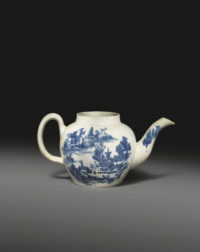 This Salisbury auction house was therefore offering what is thought to be the oldest known American porcelain teapot. “It’s extraordinarily important for many, many reasons,” said Alice Cooney Frelinghuysen, the Anthony W. and Lulu C. Wang curator of American decorative arts in the American Wing of the Met. The teapot’s use of local clays “represents the entrepreneurial spirit of 18th-century America,” Ms. Frelinghuysen said. 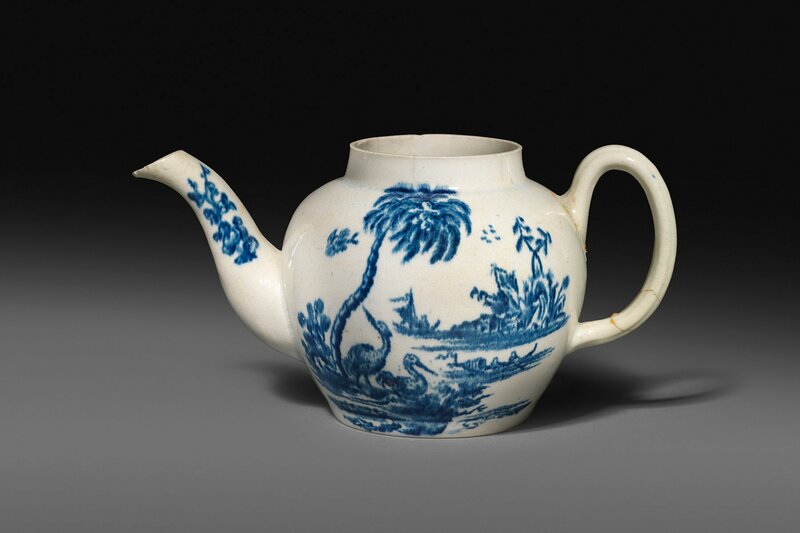 And so what may well be the oldest porcelain teapot made in America went up for auction in Salisbury, England, with a modest pre-sale estimate of £10,000 to £20,000 (ca. $14,000-28,000). 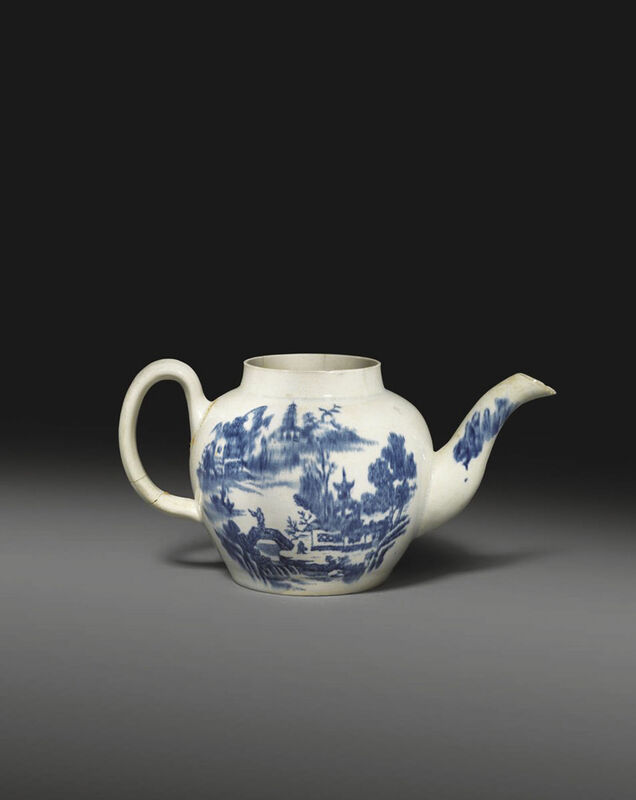 Interest in this exceptionally rare piece was high and after the last two bidders duked it out, the teapot sold for a hammer price of £460,000 (about $637,000). Once you add the fees, the $20 find cost the new owner £575,000, about $806,000. The winning bid was made by London art dealer Rod Jellicoe, beating out an American private collector for the coveted prize. The film of the lot being sold is downright gripping, the way the bids skyrocket while the auctioneer tries to keep a handle on her own excitement. Jellicoe turns out to have been representing the Metropolitan Museum of Art, so the piece is homeward bound, assuming there are no contretemps securing an export license. It would be an interesting argument for the Culture Minister to make, that the teapot made in what was then a British colony is of national significance and British museums should be given the chance to acquire it even though that would prevent its return to its native land. I doubt it would happen. Britain is lousy with historic teapots. This one’s significance is specific to its origin in what is now the US.